‘Police stations can play supportive role by redirecting petty matters to village courts for quick and amicable disposal as per village court’s jurisdiction. It helps reducing additional burden in the higher courts as well as lessening justice seeker’s harassment’- Activating Village Courts in Bangladesh (AVCB) project through its intervention since 2009 is trying to promote this important messages among the respective torch bearer of judiciary and police administration. The project works for mainstreaming village courts agenda within pertinent government agencies and actors for considering it as a viable government service. With this same urge Dr. A. 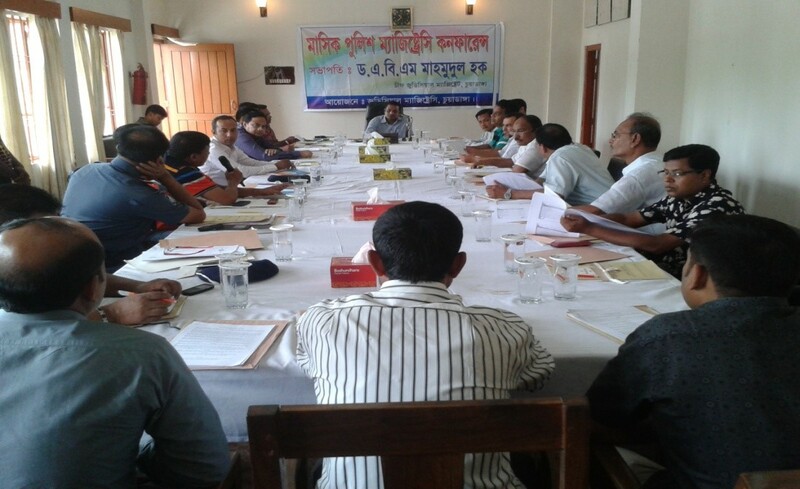 B. M Mahmudul Hoque, Chief Judicial Magistrate, Chuadanga discussed elaborately on village courts’ legal frame, its jurisdictions in their periodic Monthly Police Magistracy Conference held on May 30, 2015 at the District Judges’ conference room, Chuadanga. The conference was attended by 30 representatives from Judiciary and Police. Besides, the event was graced with local high officials like Mr. Golam Bengir, Additional SP, Chuadanga, Mr. Abdul Wahab Mollik, President, District Bar Association, Md. Anoaruzzaman, Jail Super, Md. Samsuzzaman, Public Prosecutor, Judge Court etc. On behalf of AVCB Project Md. Amir Hossain, District Facilitator, Magura and Chuadanga was present in the conference to address relevant issues on VC matters and the Project. During the presentation, Dr. A. B. M Mahmudul Hoque, Chief Judicial Magistrate (CJM), Chuadanga highlighted performance of the Village Courts in Chuadanga District and pointed out the potentials as well as relevant challenges in VC operation. He particularly emphasized on the point of referring cases by the police while it falls under VC jurisdiction, transferring cases from the District Courts as well as police station to village courts considering the merit of the case. The CJM requested all concerned to extend their hands in activating village courts as it plays a crucial role for the community peoples in accessing justice service with a nominal cost. The current government is emphasizing on this project, he added. Moreover, recommendations were made to increase coordination among local police stations, UPs and project. Both the Judiciary and Police Administration acknowledged the AVCB Project for the interventions and expressed their interest to assist the project in further scaling up its activity so that wider rural community can avail this restorative nature of justice services at their doorsteps.